ECHS Polyclinics Jalandhar Recruitment 2016 : Ex-Servicemen Contributory Health Scheme (ECHS) under Station Headquarters Cell, Jalandhar has published an employment notification for the recruitment of 39 Medical Officer, Medical Specialist, Radiologist, Gynecologist, Dental Officer, Lab Assistant, Nursing Assistant, Safaiwala, Female Attendant and Data Entry Operator vacancies on contractual basis at ECHS Polyclinics for a duration of one year. The educational qualification required to apply ECHS Polyclinics Jalandhar Notification 2016, is he/she should possess MBBS, /MD/MS in relevant specialization, BDS, Diploma, GMN, DML, 10+2, 8th class from recognized board/ University. Interested candidates who are willing to register ECHS Polyclinics Jalandhar Medical Officer Jobs 2016 should fulfill the age criteria as mentioned in the official notification. Applicants will be called for the interview, if his/her application submitted matches the required eligibility criteria. Eligible job seekers who got selected in ECHS Polyclinics Jalandhar Recruitment 2016, will be notified about the pay scale detailed offered and other allowance during the interview process or can refer the official notification. Eligible candidates have to apply for ECHS Polyclinics Jalandhar Application Form 2016 in a prescribed application format on or before 30th July 2016, improper applicants will not be considered and rejected without prior notice to the applicants. It is advised to applicants to provide correct in the applications, based on the details provided in the notification the organization will intimate the applicants to appear for the interview. The complete details of ECHS Polyclinics Jalandhar Notification 2016 will be available in the official web portal of the organization. Education Qualification: The applicants are advised to go through official notification from the below and check the qualification of each post and apply for the post for which his/her qualifications match. Pay Scale: Applicants can check the details offered to individual post from the official notification. Selection Criteria: The selection of the will be based on the interview conducted by Ex-Servicemen Contributory Health Scheme. 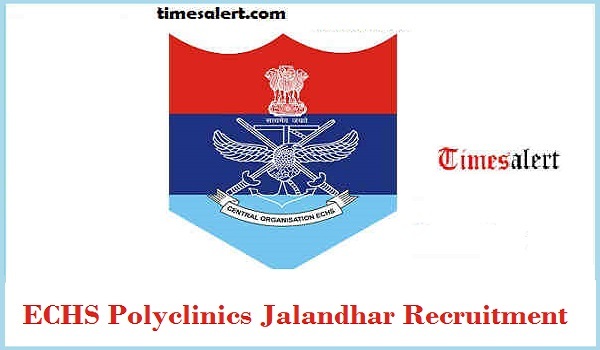 Go to official website www.echs.gov.in search for the application form of ECHS Polyclinics Jalandhar Recruitment 2016 download it, fill all the fields and send it to address mentioned in the notification on or before last date.